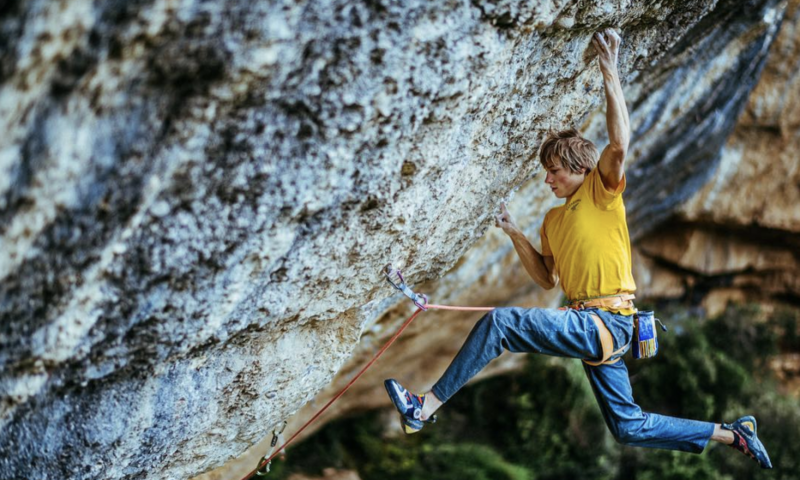 Rock and Ice talks to Alex Megos, Chris Sharma and Stefano Ghisolfi about the world’s newest 5.15c, climbed by Megos on May 9, 2018. Perfecto Mundo was a long-dormant project of Sharma’s. 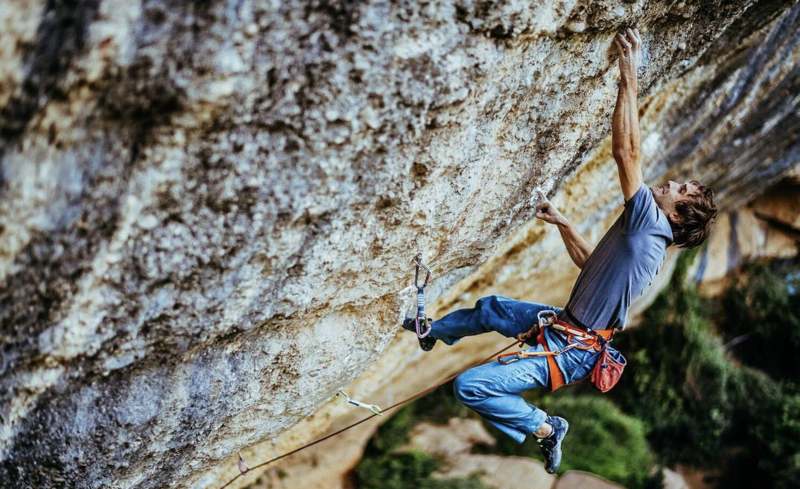 When Chris Sharma first bolted the “Perfecto Mundo Project” in Margalef, Spain, eight or nine years ago (“I’m not 100% sure,” he told Rock and Ice by phone), it represented his “vision of what the future of sport climbing looked like.” Working it over the years, he got tantalizingly close, logging his best ever burn the day he sent First Round First Minute (9b/5.15b), but he could never quite connect all the pieces—the future still lay in wait. Stefano Ghisolfi latches the crux pinch on Perfecto Mundo. Photo: Ken Etzel. Perfecto Mundo snakes up the belly of a 45-degree wall and is about 30 meters long. An easy first three bolts lead to what Megos described as “50 moves of non-stop climbing.” The first half weighs in at about 8c+ (5.14c) and is capped by a “poor,” slopey rest. 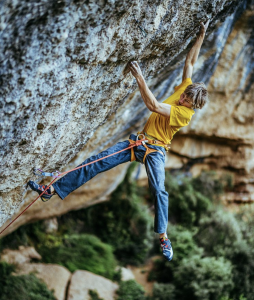 Another 10 moves and the climber arrives at the famous crux— a “crazy move from the mono to the pinch,” Megos said. A third hard section of 8b+ [5.14a] difficulties with a mantle boulder problem at the lip of the overhang marks the end of the hard climbing. Ghisolfi told Rock and Ice, it’s “still possible to fall there.”Sharma figured these second and third hard sections together were 9a+ (5.15a) on their own. Perfecto Mundo finishes with 10 meters of comparatively casual slab climbing. Ghisolifi, Megos and Sharma set to work trading burns, making links. The three would “work on tiny, little sections of beta together,” Sharma said. Megos managed to one-hang the line pretty quickly, but—like Sharma years before—connecting it all was the real challenge. About a week ago, Megos stuck the crux move from the mono to the pinch for the first time. “I knew it was only a matter of time then,” Megos said. But Megos hung on. 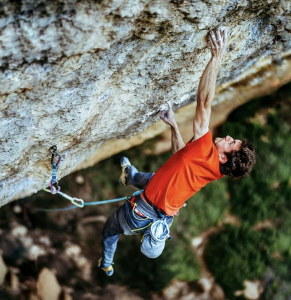 Perfecto Mundo was his first climb of the grade, and only the sixth climb in the world 9b+ or harder. The only other climbers to have sent the grade are Sharma and Adam Ondra. In all, Perfecto Mundo took Megos about 15 days of work—far longer than any sport route he has climbed to date. Back on the ground he traded hugs and congratulations with Ghisolfi, his photographer Ken Etzel, other friends at the crag. Later he got a call from Sharma. “He was so psyched for me to have done it. Humble as always,” Megos said. Throughout the process, the camaraderie of the multinational, intergenerational trio of Megos, Sharma and Ghisolfi—despite all of them gunning for the same objective—was rich. Megos said, “We were singing to Maroon 5 and Calvin Harris at the crag and laughing so much together, we had dinners together and spent rest days together. It was the most fun and friendly atmosphere you can imagine.” Sharma would make the two-and-half-hour commute to the crag from his home in Barcelona many days to climb with the young’uns, and return at night for dinner with his wife Jimena and daughter Alana. His day often started five hours before Megos and Ghisolfi’s: changing diapers, making breakfast, daycare. And Megos is excited to discover that for himself. Asked what his goals are for the future, he said simply, “Train. Get stronger. Sharma getting cruxy. Photo: Ken Etzel.